Why do Christians focus on the death of Jesus on the cross? You may wonder why Christians make so much of the execution of Jesus on a Roman cross. Secondly, it is only through Jesus’ death on the cross that we can be saved from God’s wrath for our rebellion against His rightful rule in our lives. 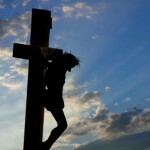 It is only through the cross that we can be reconciled to God and brought into His family. So, the cross is at the heart of the “good news”. God loves us so much that he was willing to sacrifice his own beloved Son to rescue us. That is why the cross is central to the Christian faith and that is why the cross is central to what we teach and belief at Layton Community Church for the message of the cross is foolishness to those who are perishing, but to us who are being saved it is the power of God (1 Corinthians chapter 1 verse 18).